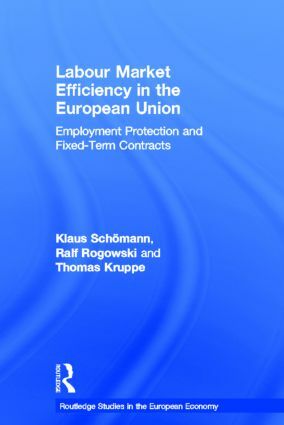 The deregulation of labour law in the European Union was thought to be a spur to lasting growth of employment and an increase in labour market efficiency. This book reveals that the results of such policies have been far from those expected. This study provides a country by country overview of the legal regulations concerning employment protection and fixed-term employment in the twelve Member States of the European Union (prior to its expansion in 1995). Employment patterns of fixed-term employees are compared with those of employees in standard employment relationships, with the analytical focus on age-, gender- and industry specific differences. The authors then look beyond country-specific patterns and assess the probability of fixed-term employment within the European Union. They offer hypotheses concerning the impact upon the labour market of deregulation and of regulation. This is a valuable discussion of how legal, sociological and economic labour market theories contribute to an understanding of atypical employment. Routledge Studies in the European Economy is our home for cutting-edge, upper-level scholarly studies and edited collections. Featuring compact and well researched volumes of 150 to 300 pages, the series provides a range of content considering the European economy alongside history, politics, cultural studies, agriculture, education, globalisation, and other subjects, titles are characterized by dynamic interventions into established subjects and innovative studies on emerging topics.